Protesters stage a demonstration in front of the closed HUL thermometer factory in Kodaikanal. 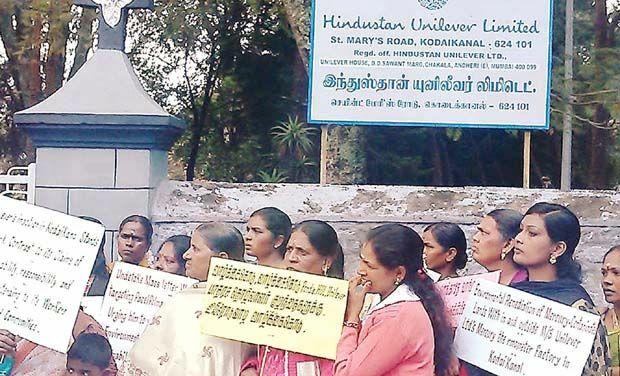 Chennai: The Anglo-Dutch consumer goods giant Unilever, which owns 67 per cent stake in Hindustan Unilever Limited (HUL), still lives in denial about allegations of mercury poisoning in Kodaikanal. Replying to questions raised by campaigners in the United Kingdom for justice in Kodaikanal during the recent annual general body meeting held in Leatherhead, UK, on April 30, Unilever CEO Paul Polman said it was a long-term issue and that they wanted to resolve it. He said they had 16 meetings with the people concerned. He added that there were many obstacles including NGOs and also people who had never been to that place, indirectly blaming them for delay in action. Mr Saleh Mamon, who attended the AGM as proxy shareholder and raised questions, said Mr Polman did not answer any questions specifically. Mr Mamon sent a brief note to Chennai-based environmentalist Nityanand Jayaram, who is in forefront of the fight for justice to victims of mercury poisoning in Kodaikanal, on the AGM. Mr Mamon said he had asked Mr Polman five questions for which there was no positive reply. The questions were on the need for an independent assessment of the depth and extent of mercury contamination; need to have a monitoring mechanism set-up to protect the environment from the spread of contamination due to rainfall, etc. ; when will decontamination resume; time to have an independent epidemiological study carried out to assess the mercury poisoning of ex-workers; the need for an interim framework of medical care for ex-workers; and also to provide them with a living allowance as many of them are destitute. Mr Raja Mohammed, secretary of HUL ex-workers association, said in these 14 years, at least 100 women ex-workers developed gynecological problems, either had abortions or delivered still babies. The surviving children suffer from diseases like celebral palsy, kidney and skin ailments. At least, 50 male ex-workers are facing problems of infertility and 48 are already dead. Social activist Swetha Narayan, working closely with the victims, said all they were asking for was an independent epidemiological study of the entire workforce to find the root cause of these continuing human losses. The case filed in Madras HC by HUL ex-workers association in 2006, was last listed for hearing in February 2013. Since then, it hasn’t been listed and from 2013 till date, three people have died, she said. Over 700 ex-workers registered with the association are waiting in the hope of compensation and long-term healthcare, she added. Unaware of what she was breathing and handling, Velangini Messi, then 18, spent three years of her ‘joyful’ teenage life in Hindustan Unilever Limited (HUL) in Kodaikanal that was manufacturing thermometers dealing with one of the world’s dreaded substances – mercury. Engaged as a contract labourer for a paltry Rs.25 per day, Messi’s job was to sweep the toxic mercury area. She claims that the company just gave her a overcoat and never issued any safety guidelines. At times, she said, she used her bare hands to pick up hazardous mercury waste, just like most rural women do at home. During those three years (1997-2000), Messi often complained of headache and stomach pain, but it was not taken seriously. Only a year after Messi left the job and HUL was forced to shut the factory in 2001 – after being found guilty of dumping 5 tonnes of broken thermometers in a local scrapeyard – she realised how the company compromised on her and many other workers’ safety. Messi got married in 2002 and shifted to Munnar in Kerala, where her husband works as a labourer in a coffee estate. Her problems just began. She suffered six abortions and the doctors ‘unofficially’ said it was due to mercury exposure. She managed to deliver a boy, who is suffering from visual defects. “My husband wants another baby, but doctors warned against it. I was forced to undergo family planning last month after another miscarriage and doctors said another baby means certain death. Regularly, I vomit blood and on medication all the time,” Messi, now 35, told Deccan Chronicle. Danalakshmi (44) also attributes her husband Natarajan’s death to the callous safety measures of HUL. She said Natarajan worked with HUL from its inception till its closure. He died in 2007 and his death certificate says he died of kidney failure. But all the doctors who treated him in Madurai and Kerala ‘said’ his condition was due to mercury poisoning. “A few years after my husband’s death, my 24-year-old son also passed away under similar circumstances. Don’t know when I am going to die. I can’t walk and stand and suffering from memory loss and kidney problems,” she said. Another ex-employee of HUL, Vijaya Lakshmi also says she experiences severe stomachache and has lost all her teeth.